do stuff! » First VIP club 2016 hat pattern: Provocateur! 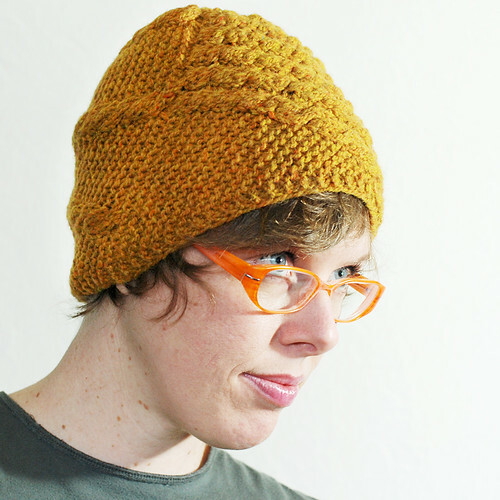 First VIP club 2016 hat pattern: Provocateur! 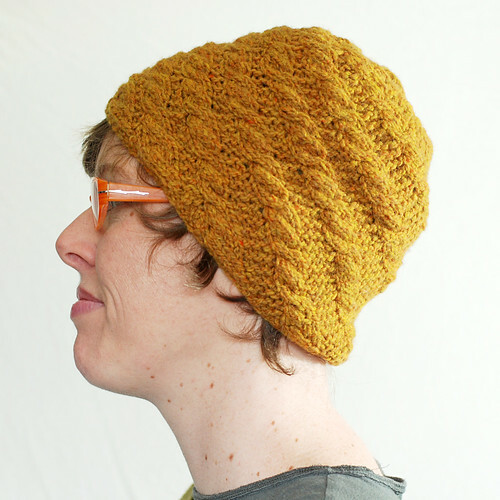 The first leethal VIP club hat mini-mystery-knit-a-long happened early this month, beginning on February 2nd and (the mystery) ending last Tuesday the 9th. 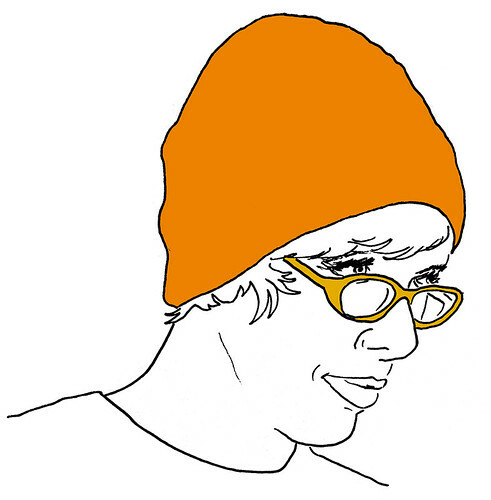 The KAL continues a bit, as knitters can still post their projects to the forums, since a one-week KAL is so quick, but there’s no more mystery. 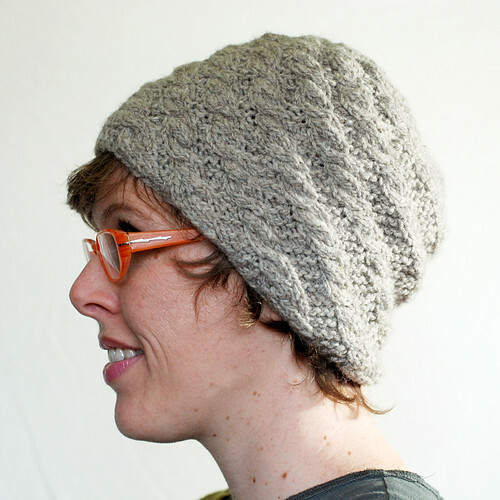 The hat, Provocateur (ravelry link), looks like this! 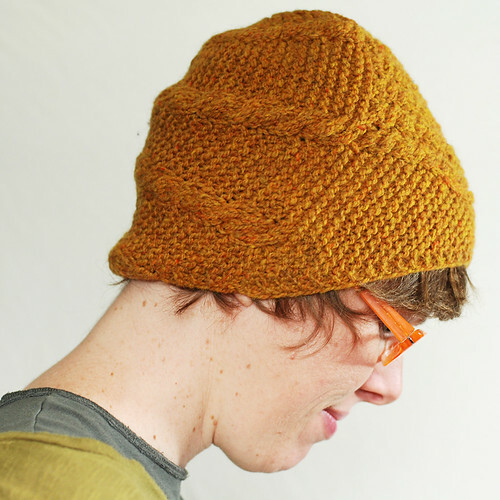 It’s constructed sideways, knit flat, with short rows making the crown shaping, decreases along the bottom and staggered increases making the bias design, with cables flaring down diagonally from their starting points squished together at the top. It’s designed for worsted-aran weight yarns, with three different gauges making for three heights. My grey sample (below) is the largest gauge, using Cestari Traditional Collection 2 Ply aran weight yarn, for the tallest/slouchiest height; my orange sample (above) is the medium gauge, using Harrisville Designs Highland worsted weight yarn, for a semi-slouchy height. There are three different circumferences given, which vary depending on gauge/height (all details are included in the pattern), but you can also customize your circumference by stopping at any time, making it custom fit to your head by trying it on as you go. 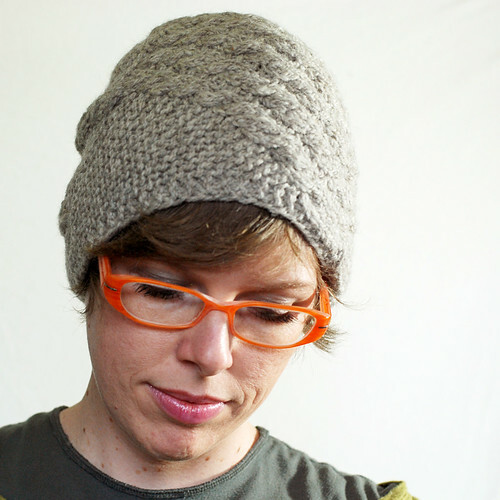 Both of my samples are worked to the medium circumference row count, which is a medium circumference in the orange (medium-gauge) sample, and a kind of large or medium/large circumference in the grey (large-gauge) sample, for an extra loose, slouchy hat. The whole pattern is written and charted, so knitters can work from whichever is easier for their brains. The project starts with a provisional cast-on (instructions included), and ends with a 3-needle bind-off to seam the two edges together, which creates a pretty much invisible seam in the garter stitch, as you can see below. 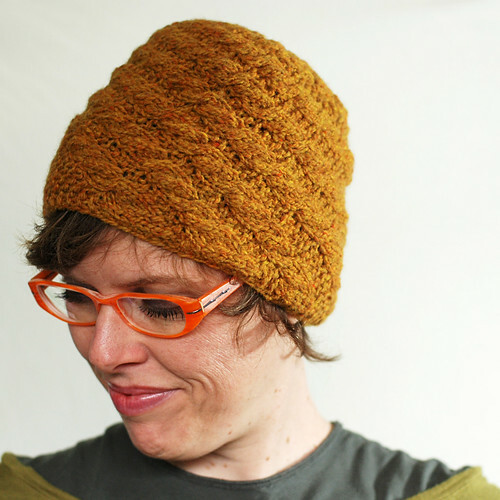 I have tutorials for cabling without a cable needle here on my website, which will make the project go much more quickly! The cables are basic – 2 front stitches twisting left over 1, 2, and 3 back stitches – but there are seven cables on every single right side row for awhile. The rows go more quickly in the second half, as the cables hit the bottom edge and there are six, then five, then four, then three cables per row. 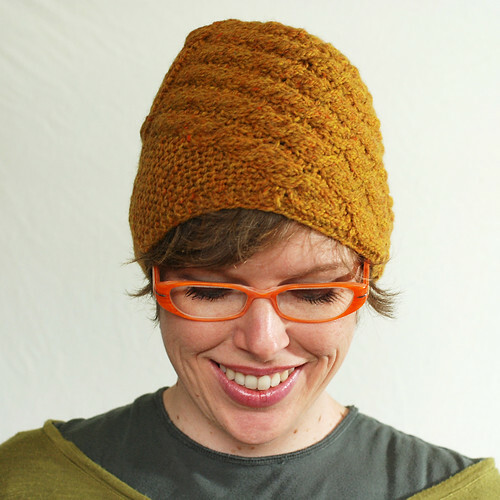 I recommend using either the shadow wraps or the German short rows method for the short rows – I have tutorials for both on my website here – because of how you’ll need to sometimes work wrapped stitches into cables. I used shadow wraps on one sample and German short rows on the other, and they both worked well for me. It’s meant to be worn this way, with the seam over the right ear, so that the cables shoot down from the top in front, and then are spread out in the back which helps the back slouch down nicely. 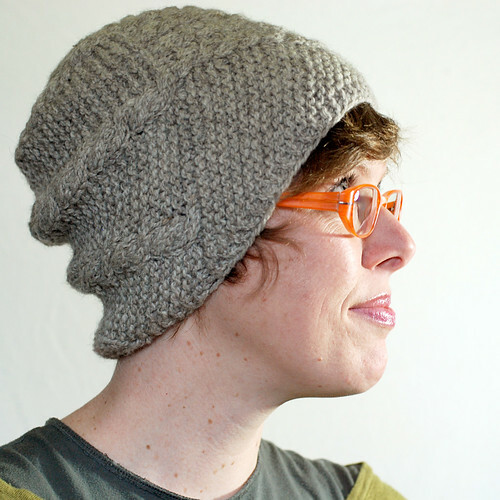 I am REALLY happy with how this pattern turned out – one of my favorite hats I’ve designed! This pattern will continue to be a part of the leethal VIP club, going out to all new members, throughout the whole year. Five more hat patterns will go out to club members, one every other month – they will all have different kinds of constructions, and different techniques and stuff. Provocateur will be released for individual sale a year after its initial release, so in February 2017. Check out all the awesome Provocateurs on ravelry to see what it looks like in different kinds of yarns, colors, sizes, etc. I love them all! 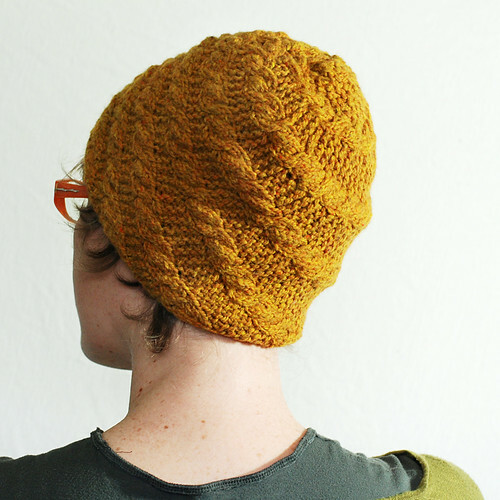 And sign up for the club (on ravelry here) if you haven’t already, to get this pattern immediately and then the other five hats in time to join the knit-a-longs. This first one has been so much fun! !